I woke up this morning to a question about why certain collections at DC Comics go out of print. Especially ones with Barry Allen, Wonder Woman, and other characters that you think would never go out of print. That’s something I’ve always pondered too as I remember seeing the Secret Six books for example go out of print for a long time until the new collections. Sometimes certain books go out of print because they’re planning a deluxe edition of a book, new collections adding more material, omnibuses, and sometimes a book just goes out of print for no good reason. It’s the same with Marvel too. Heck if it is a book that doesn’t have a wide appeal and gets reprinted, I’d recommend getting that as it will end up going out of print. The really niche stuff that gets reprinted I find goes out of print before you know it. Don’t even get me started on Humanoids, seriously that company if you don’t pre-order those suckers they’re out of print faster than you can blink. Seems to me they’re trending more towards digital collections nowadays though so at least that much, that’s cool at least. For most collections at a comic company, they’re pretty much a lock to stay in print for awhile. Now with Marvel and DC there’s usually the HC (Hardcover) then after awhile the TPB (Trade Paperback) hits after that. Now with most books say Watchmen, Dark Knight Returns, and so forth, they will never ever go out of print. Same with Marvel as they have their collections that will never go out of print too, Civil War for example. Of course the one factor with DC and Marvel is they both do have robust digital options that if you don’t mind a digital copy of a book, you can get it that way. Marvel has Marvel Unlimited so you can also read a lot of out of print stuff that way too. Same with most companies now if you can’t get a certain book in print, you can usually get it digitally via Comixology, Amazon, or other digital comic selling companies out there. At least now there are ways to get books that are out of print. Back in the day if a book fell out of print you were going to be doing some hunting. Heck there are still many books that aren’t available digitally so you still have to do some hunting for certain series out there. Good luck in your out of print trade hunting adventures, hopefully I made it a little easier. A good question on twitter led to me writing this and was this ever a fun thought process to go on. After multiple years of the Original Sailor Moon anime being out of print and going for heavily inflated prices across the Internet, rejoice as Viz is bringing the series back to life! I cannot believe this myself as I read this announcement, it’s taken long enough for somebody to get the license for this anime. One of the most in demand anime on the planet that no one could get without paying an arm and a leg for is going to be seen again. Viz is doing the route of streaming it online via their own streaming service NeonAlley and Hulu starting on Monday, May 19, 2014. Now they are working a new dub and by the way it’ll be uncut, meaning all of the original Sailor Moon Anime will be seen the way it was meant to be. Yes all 200 episodes uncut, all three of the movies, and starting in the fall; the first time the series will be on Blu-Ray with a DVD release with half season sets. Take a look at the trailer below to learn more on this as I get the feeling as I share this link with everyone else, the fanbase is going to be losing their minds. Many of us out there that had been watching to watch Sailor Moon can finally see it again. The best part being if you want to watch it streaming you can do that to get yourselves pumped up for the fall release. Then the dub is being worked on for a release later in the year. If you want more info on just what Viz Media is doing with the Original Sailor Moon programming check out the interview Charlene Ingram and Josh Lopez did for Anime News Network here. The interview is well worth the read to learn the restoration efforts going into the series and their dedication to the material. Even further as to how they got the license to the original Sailor Moon in the first place. I’m excited to finally see the series available in the states again. It’s been a long time coming for the Original Sailor Moon to return, now she’s back and better than ever. If you’re a new anime fan, I’d highly recommend watching the Original Sailor Moon to see what you think. For us old school anime fans can only say that Sailor Moon was a big part of our fandom, now it is time to show the new generation why it was a big part of our world. The 90’s are all powerful and we are helpless to stop it, we embrace you 90’s overlords in all of your glory. Now you wonder why I make that statement. As I was reading Robot 6 today, I saw a story on Death of Wolverine and “Weapon Etched Holo Foil”, you read that right. As the 90’s gimmicks have been making a comeback, I will say that they’re being done with some level of heart to them. Like this “Weapon Etched Holo Foil” but Mike Marts, who is the Executive Editor, decides he really likes Steve McNiven’s cover and wants to give it the deluxe treatment. At least now it’s not just being done to be done, as I feel there’s some reasoning behind these covers making a comeback. I think it’s hilarious that these gimmick covers are returning the way they are. Focus on this, if you don’t want the “Weapon Etched Holo Foil” you don’t have to get it. From what I can tell this is a pure variant cover so totally optional. Just another of the likely multitudes of variants that will be released with The Death of Wolverine. The creative team I was already behind, Charles Soule is a great writer who’s behind one of my current favorite series out of Marvel being She-Hulk, which you should all buy by the way. On the artist side Steve McNiven is an impressive artist who’s never been one to disappoint, now put these two together and you have an event weekly series in itself. This is the day and age we’re in though where variant covers are the lifeblood and the Death of Wolverine is going to be a huge weekly event in September. I will be curious to see how McNiven’s cover is handled in this “Weapon Etched Holo Foil” format. I’m still going to check out the series because I admit I am curious. Yes we all know that Wolverine will be back from the dead after Death of Wolverine, if anyone thinks he’s actually dying then I don’t know what to tell you. 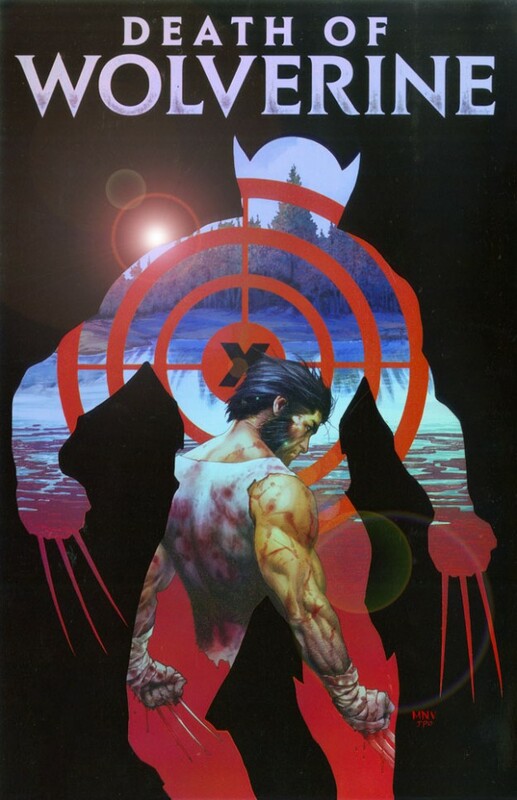 At least Marvel is sealing the Death of Wolverine in “Weapon Etched Holo Foil” covers, because at least in this case it fits the situation. 1990’s you were a glorious decade in cover gimmicks, twenty plus years into the future your influence still remains strong. Flash Fact: Following The Arrow Season Three finale, now the hype machine begins for The Flash Series premiere. The first trailer was shown last night during Arrow making it clear that the series is going to be a big part of Arrow’s universe. Just a sweet way to show that while Arrow and The Flash are two unique series, the connection will still be there and prominent. Even better showing the personalities of the two characters and how different but similar they are in their own way. Check out the fun trailer first, that I am going to show below. It’s a cool trailer that can give you a great idea as to how Barry Allen’s Flash is being trained. The hashtag of Don’t Blink is perfect for this show, even the logo for The Flash screams fun for this show. The longer trailer shown today gives us more of an idea of the tone The Flash will have. You can see the full interconnected nature of The Flash and Arrow highlighted further and get an idea as to how the series will play out in the months to come. I love that they’re putting Weather Wizard in this as the first major Rogue, I am surprised they’re not using Captain Cold but that’s for the full Rogues later on. This is the trailer that made me excited for The Flash and made me realize that The Flash and Arrow are going to compliment in each other in a brilliant way. Check out the full trailer below and see what you think. I’d love how Grant Gustin handled Barry Allen in the Arrow episodes he was in and he plays The Flash with that same energy. The suit in motion looks a lot better than what the still shots gave me. Now I am full speed ahead in being jazzed for The Flash. The CW putting this on at 8 pm on Tuesday bugs me a bit as I would love to have had the Arrow and The Flash power lineup. To speculate here, maybe the CW is going with splitting up the shows over two nights for crossovers and having more live eyes on the network. DVR views are huge but the live audience is huge and keeping viewers engaged for two nights of live programming would be huge. Of course the other speculation is not having two superhero shows in one night that could just be too much of a good thing to have right now. Either way, The CW is going to be a happy network this year I think. Between Constantine, Agents of SHIELD, Arrow, Gotham, and now The Flash hitting the airwaves this fall, this is an exciting time. Prepare your DVR’s, your snacks, and whatever other preparations you need to make, we are in for one amazing fall season. The Flash is just one part of a sequentially beautiful year in comic book television. If you may or may not known I did a column for Comics Crux and for a short time at Rhymes With Geek called Arrow Analysis. I ended up putting the column on hiatus to focus on other matters. Now likely next season for Arrow I’ll revive Arrow Analysis because the Season Two finale set the stage for big possibilities. If you deal with Agents of SHIELD, the uptick for that show happened just before and after Captain America: Winter Soldier. Season Two of Arrow was on a high from the beginning outside of stumbling a bit at the midpoint, mostly in Laurel Lance’s character development. Outside of any stumbling points in Season Two, Season Three of Arrow looks like it could be mindblowing. By the way get your spoiler goggles on now, because this is where I pull no punches and start revealing extra stuff left and right. Spoilers are now officially on because if one warning isn’t good enough, two should be sufficient to get my point across. Now that you’re still here now we can begin, Arrow’s Season Finale gave us multiple changes to characters and new situations to play with. Thea Queen now moving on to be with her Dad, Malcolm Meryln which will be the set up for more appearances from Malcolm in the future. I’m looking forward to Thea’s evolution as a character, I hope that the series spends time with her as she gets to know her Dad. The train station scene of Thea and Malcolm shows that she has a lot more in her than even she realized. I don’t think this will end up being the generic someone becomes evil, I’m thinking along the lines of Thea becoming a stronger version of herself thanks to someone who’s accepted who he is. That’s my own theory on this one as Thea Queen’s evolution has only just begun. At this point I am begging The CW at some point to do a Suicide Squad spinoff because Amanda’s team needs more screen time. Deadshot popping up in that last bit near the end made me so happy. The next step towards a stronger presence for Deadshot next season, especially with Diggle about to be a Dad with Lyla’s baby on the way. That ties A.R.G.U.S. into Arrow’s universe even more. Now that the flashbacks are going to be centered around Ollie’s time with Amanda Waller in Hong Kong, we’re going to be getting tons of A.R.G.U.S time next season. I’m happy that we’re not going to see a different setting for the flashbacks next season. I was so burnt on The Island flashbacks it was unreal so a new surrounding for them is a breath of fresh air. Of course The Island is still a factor, Deathstroke is now there in the beginning of the A.R.G.U.S. supermax it seems. That is a slick idea especially when you realize Waller and Oliver Queen already have a relationship of sorts, it makes all the more sense how The Island became known to her in the first place. That’s actually the clever part of this season finale, the threats are all around but in a new way and the possibilities of new allies in the process. You even have the Black Canary set up with Laurel Lance though we’re not going to see that for a long time, Sara only gave her the jacket and Laurel has training to do. I was shocked though at Quentin Lance’s collapse, I’m shocked at what went down there. Now as for speculation for next season, Roy is now Arsenal/Red Arrow depending on what name they use. That’s about all you can dive into there as really now that Thea is out of the picture, Roy is going to be focused on that. Felicity probably got to be part of one of the best teases in Arrow history with that relationship fake out on Deathstroke. The confusion and cheering that was happening at that moment was wonderful that turned out to be a larger scheme. Of course now the next focus is Diggle and Felicity with friends likely enough to help Ollie get back his company. That is going to be fun to watch, Oliver’s Arrow life is stronger than ever just he now has to get his secret identity life back in order. I’m hoping that they don’t do the year jump like they did last time, it would be fun to see Arrow spending the season rebuilding itself. I wouldn’t be shocked if Season Three did another jump in Arrow to set things in motion. I’m going to repeat myself though on this, don’t do the time skip again as that gimmick can only be used once or twice in the history of a series. I want to see Arrow built back up before my very eyes, I want to see all of third season happen in a way that blows my mind. Arrow Season Two blew Season One away, maybe Season Three will be the time I revive Arrow Analysis once more. Until then, here’s to Season Three of Arrow being even better than the second.